He said that if you're not used to doing speed work, it's best to just focus on building a base of endurance training during the off season. If you've been doing speed work, however, and then you stop for a while, you'll be more likely to get injured when you resume speed work because your muscles will have to adapt to that again. That makes a lot of sense! Speed work increases risk of injury, especially when you first start doing it; so by doing a small amount of it even during the off season, you are reducing your risk of injury when you start training hard again. He said that you don't have to do much at all--just some very short, very fast sprints will be great, and have little risk of injury. 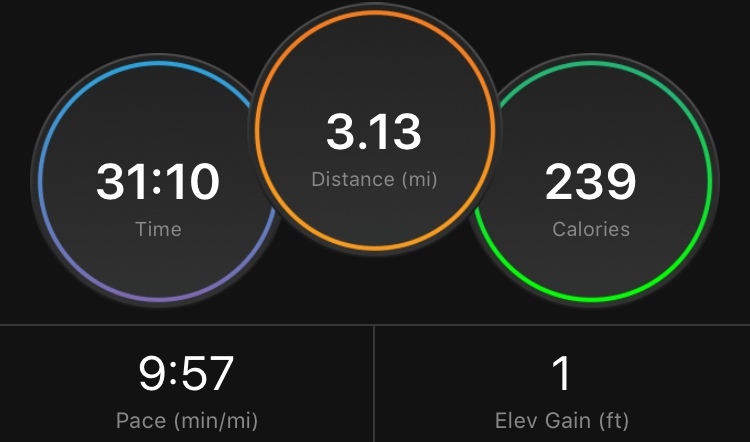 Out of all the speed work, the short and fast intervals are my favorite. Today, I decided to do a 10 x 45 second workout that I did back in December. 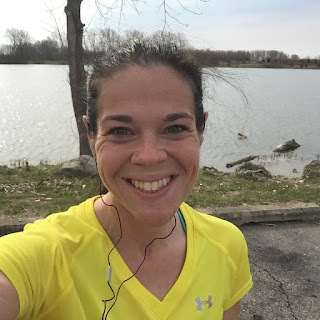 I've done it a few times, but I think the last time I did it outside was in December--I usually do it on the treadmill, because the intervals are so short. I was curious to see how my speed today compared to a few months ago. I'm getting bored with the roads around my house (one of the problems with living on a peninsula is that there is only one road to get OFF of the peninsula, so I know that road like the back of my hand.) To get a change of scenery, I went to the State Park this morning, even though my run was going to be really short. I wore the yellow shirt that I wore for my first marathon, and this was the first time I've worn it since that race. It was snug when I wore in 2012, and then in 2014-2015, it was TOO tight to even wear in public. I was really surprised when I put it on this morning, then, when I found how big it was! It's an Under Armour shirt that is meant to be form-fitting, but it was very loose on me today. I wore it anyway, but I don't think I'd wear it to a race or anything. That was a fun (and unexpected) non-scale victory! I chose the 5K loop, and ran 10 minutes to warm-up. The new heart rate strap I bought isn't working, so I spent the first 10 minutes adjusting it, trying to get an accurate reading. So frustrating! I might just need to buy a whole new monitor (the strap is cheap, about $15; but the monitor is about $100). 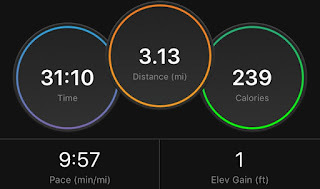 The workout on my Garmin was set to 45 seconds fast, and then recovery until heart rate reaches 136 bpm; and since my HR strap wasn't working (it was reading very high), I knew I'd just have to manually start each lap of fast running. I settled on a one-minute recovery, which ended up being pretty perfect. When I do the 45-second sprints, I like to do a walking recovery, because I run the sprints nearly as fast as I can. As soon as I hit the first sprint, I was surprised at how clumsy my legs felt. The first interval is always the hardest (I read somewhere that the first being the hardest is very normal, because your legs need to be "primed" for the intervals--and that first one is the primer). I love how short the 45 seconds feels! It's almost like as soon as I get into a rhythm, I only have to hold it for about 10 seconds before it's time to walk. I did a 45 second sprint, 1 minute walk for a total of 10 times, and then jogged the rest of the way to my car to cool down. It felt like a good workout, and it went by SO quickly. The fastest one was a 6:17 pace. I'm in awe of the elites who run full marathons at a sub-5:00 pace! I think it would be pretty cool to see a 45-second sprint at a sub-6:00 pace one of these days, but sub-5:00? Mind-blowing. I can't believe today is only Tuesday... it feels like it should be at least Thursday! I'm totally ready for the weekend. Great post Katie! I'm definitely going to implement low heart rate training/ 80/20 running once I am healed from my ACL repair. I love seeing your progress! Katie, before you give up on your HR strap, have you tried some cream? I get a lot less crazy readings from mine when I use it. These intervals are incredible!! I'm wondering how you stay so motivated each day. I feel like I am constantly hungry and thinking about food, but if I eat when I'm hungry (as opposed to counting calories) I invariably eat far too much. I actually enjoy the feeling of being really full. How did you train yourself to stop eating if you're no longer hungry? At first, I stuck with a schedule--breakfast at 8:00, lunch at noon, dinner at 4:00, and dessert/snack at 8:00. Sticking with a schedule helped my body to get used to eating at those times, so I wasn't constantly wanting to eat. Stoping without overeating is the hardest part, though. When something tastes good, it's hard not to eat more of it! Again, though, I think my body just got used to smaller portions (at first it was hard, but it got easier as my body adjusted). Basically, I just served myself a "normal" portion of food, and I didn't go over that. If I was truly still hungry after eating, then I would allow myself to eat more, but that was very rare. A small portion is surprisingly satisfying (physically). Now, I really hate the feeling of being TOO full (I, like you, used to enjoy that feeling). The thought of being too full actually stops me from overeating sometimes. Good luck! It's not easy by any means. Thanks so much for taking the time to write back! That is really helpful to know. I think sometimes I just need to hit the pause button rather than rushing back to the fridge. ;) Also, I find myself starting to panic when I'm hungry, which is ridiculous because I am never actually starving. I like the idea of serving yourself a normal portion and sticking to it -- I will try that!